63 Foot Grebe Flush Deck | Christian & Co. The vessel was inspected while hauled. Hull construction material is wood plank over wood frame. Deck is constructed wood with teak overlay and above deck structures are constructed of wood. Bulkheads are constructed of plywood. Overall condition of the hull structure appears marginal – satisfactory as there is significant deterioration of wood about metal components including rudder ports, starboard propeller shaft alleyway, propeller shaft struts, swim platform mounts/fasteners, engine exhaust, bonding strap connecting bolt port aft in the engine compartment, port engine raw water by-pass through hull, starboard engine raw water supply through hull, hull to frame connection inboard and aft of the port transmission, raw water supply through hull forward bilge in the aft companionway and forward and aft through hulls on the port hull side at the waterline. Various frames exhibit fractures in the forward bilge that have been sistered and appear in satisfactory condition but there is some surface delignification of various frames and planks in this area. Six fasteners were pulled for inspection. Condition is as follows; starboard forward 7’ aft of stem one plank in from garboard significant deterioration, starboard aft of forward quarter nine planks in from garboard significant deterioration, starboard aft five planks in from garboard between aft and intermediate struts corrosion of center threads. Port fasteners as follows; forward 6’ aft of stem one plank in from garboard threads wicked down in center, aft of amidship eleven planks in from garboard fair condition and six inches aft of aft intermediate strut threads wicked down in center. The vessel’s weight is 92,000 lb. (travel lift’s scale). Exterior rails and hardware appear excellent. Cosmetic condition of vessel appears excellent externally and excellent internally. Vessel’s external colors are white with red boot and accent stripes with varnished Mahogany topsides. Below waterline through hull fittings appear satisfactory except both engines raw water by-pass through hull valves exhibit corrosion and most through hull valves are seized. The vessel is equipped with no manual and six electric / automatic bilge pumps and two were accessed and functional. The bilge is holding minimal standing water. The ventilation system consists of natural ventilation and appears satisfactory. General housekeeping appears excellent. Engines’ external surfaces appear good and exhibit no significant corrosion. Engine hour meters exhibit P – 963 and S – 1018 hours. Motor mounts appear satisfactory. The engines were not test run however; are reportedly working. Cooling systems appear satisfactory but there is moderate salt build up about the raw water pump impeller covers. Fuel systems and components appear satisfactory – good. Exhaust systems and components appear satisfactory. Electrical systems and components appear satisfactory. Engine control systems appear satisfactory and shaft logs appear satisfactory. 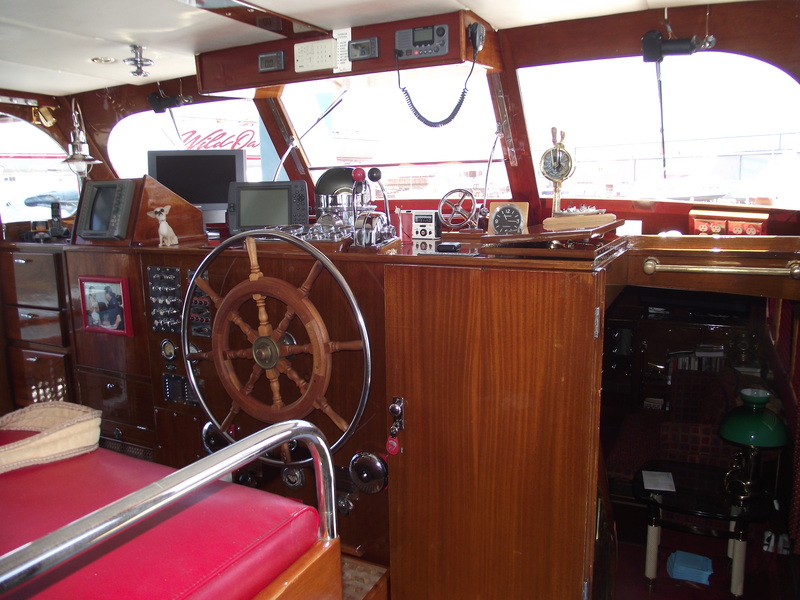 Steering control systems appear satisfactory except there is deterioration of wood at cable pulley attachments in the lazarette and rudder ports appear marginal due to deterioration of wood. Propulsion components appear good externally. Generators’ surfaces and motor mounts appear good. Generators’ peripheral components and systems appear good but there is some corrosion about the forward generator’s raw water connection to the exhaust mixing elbow. Waste system and components appear satisfactory. General service seawater systems appear satisfactory. There is an undetermined gallon capacity in two alloy tanks located outboard of engines. Fuel tank surfaces, where visible, appear satisfactory (mostly covered). The fuel fill, vent, feed and return lines and components appear satisfactory but hoses are aged. Fuel shutoff valves are located forward in engine room and appear satisfactory. The AC shore cord was not separated from the inlet. The AC wiring and outlets appear satisfactory but there is no G.F.C.I. protection. The AC main feeds are protected with circuit breakers. Battery arrangement appears satisfactory. Batteries are equipped with disconnect switches. DC wiring appears satisfactory. Circuit protection for the AC and DC branch system appears good. Wire terminations and connections appear satisfactory. Wire organization and arrangement appear satisfactory. Vessel has five portable fire extinguishers with expired certification. Vessel has one fixed fire suppression system expired certification. The safety components include: fifteen PFDs and one throwable PFD; distress flares with expired certification; one life raft with expired certification; suitable first aid kit; one anchor with chain and line and appears satisfactory. Navigational and anchor lights appear suitably arranged and installed. Other safety equipment includes a roof top spotlight. The vessel is a semi custom flush deck motor yacht constructed of wood that was built by Henry C. Grebe. The vessel is equipped with twin inboard diesel engines. The vessel owner was not present during the inspection but Joaquin (full time crew) did attend the inspection. Joaquin stated that the vessel does not have a captain as Mr. Lewis uses the vessel dockside only and no longer takes the vessel out for harbor cruises. The vessel is in excellent cosmetic condition both externally and internally. The vessel hull structure overall appears in satisfactory condition except in areas where through hulls and various metal components are installed that have significant deterioration of wood about the metals. The cause of this was not determined but may be associated with the bonding system of the vessel. Various areas of the hull interior were accessed on a following trip and there was significant deterioration about struts, a port side bonding strap and aft companionway through hull at the forward end. Struts below the berth were not accessed. At the time of the second inspection; work was underway by the shipyard with wood removal about the port side through hulls and transom. It was reported that they intend to address all areas found to have deteriorated wood. Upon completion of the recommendations, the vessel should be suitable for its intended use as a protected waters motor yacht without re-fastening. *This value is in consideration of all wood related recommendations completed while hauled out. If the vessel were placed on the market; it would not be unreasonable for the sales price to be substantially higher given the celebrity status of the owner. Recommendation compliance summary: We re-inspected the vessel while afloat on September 7th, 2015 for compliance of recommendations while the vessel was afloat at the Marriott Marina in San Diego, California. There was reportedly over two hundred fasteners replaced on the forward hull bottom area since our interim inspection of the hull repairs prior to launching of the vessel. All through hulls have been replaced. An electrician was hired to install GFCI circuits and reportedly check disconnected wires to assure they have been de-energized. The bonding system was reportedly checked by a technician and an additional zinc plate added onto the transom. All recommendations have been addressed and the vessel suitable for use.